The Scoop: Under the motto “Strengthening marriages one date at a time,” The Dating Divas team has striven to give married couples a reason to spend more time loving, laughing, and leading fulfilling lives. The advice blog recommends useful programs, tools, and resources for couples while also suggesting fun date activities and romantic adventures to spice things up. Now, as an authority on all things romance, the Dating Divas have launched a text-based service called the 10-Minute Marriage Challenge. This service will send married women, men, and couples weekly romantic ideas that take only a few minutes to complete. The Dating Divas team firmly believes all it takes is a few minutes a day to make your partner smile and remind him or her why you fell in love in the first place. The Dating Divas blog began as a dating project among friends. Tara Carson wanted to bring some fun back into her marriage, so she challenged her married friends to join her in brainstorming and executing a series of creative date ideas. Their dating project was a great success, and it soon expanded into a comprehensive website where women can now find everything from anniversary gift recommendations to marriage counseling programs. Today, over 20 married women on the staff work together to develop cutting-edge resources that can help couples keep their love alive for years to come. The Dating Divas’ primary audience is women, but for years they’ve toyed around with the idea of creating Dating Dudes for married guys because the team’s marriage advice can work beautifully for both men and women in long-term relationships. The Dating Divas is a marriage-oriented blog with over 630,000 followers on social media. 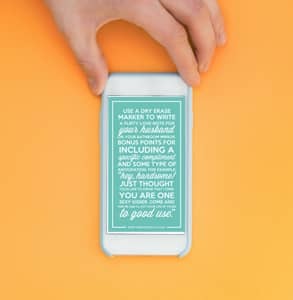 In addition to its DIY lists or self-help programs, the Dating Divas recently launched a text-based service to inspire husbands and wives to take care of each other and express love in a variety of ways. The 10-Minute Marriage Challenge is basically a three-month love calendar with a romantic to-do list updated via text. The Dating Divas send subscribers simple, actionable ideas to show affection and create romance in their daily lives. As the name implies, these challenges should take no more than 10 minutes to complete, yet they can make a world of difference in a marriage. Melissa Hunt, Assistant Site Director for the Dating Divas, said the team has received great feedback on the text service so far, and it has actually sold out. They’ll be taking sign-ups again in a few months. Relationships are a two-way street. It takes two to tango, as they say, so any relationship exercises or challenges have to involve both partners if they’re going to work. That’s why the Dating Divas team has devised a HIS and HERS version of the 10-Minute Marriage Challenge. When you sign up for the 10-Minute Marriage Challenge, romantic inspiration is delivered to your phone every week. Couples can sign up for the marriage challenge together, and embark on a journey to put some spice back in their relationship. The Dating Divas cleverly mixed up their content, so husbands and wives won’t receive the same texts on the same days. The Dating Divas offer this adorable text-based service for $30. That’s less than a romantic dinner! Couples going through a rut can sign up for the 10-Minute Marriage Challenge to receive weekly inspiration for three months. There are three versions of the service for women, for men, and for couples, so everyone walks away happy. The HER Version of the Marriage Challenge is designed to help married women bring the spark back into their relationships. Every Wednesday and Friday for three straight months, the Dating Divas come up with a romantic idea and send it via text to the women signed up for the service. These ideas typically take 10 minutes or less to pull off — it could be as simple as writing a loving note to your guy — so women can be a little spontaneous and surprise their loved ones with a sweet gesture or gift. Additionally, every Monday, the Dating Divas team sends out a fun date idea for that upcoming Friday. How about planning a picnic? Or going to an aquarium? The service gives women plenty of inspiration. Every Wednesday and Friday, wives will receive a text with a fun, flirty, romantic idea to do for your husband. Again, these are meant to take 10 minutes or less, and are chock-full of unique, thoughtful, man-approved challenges to keep the spark alive. In addition to the Wednesday and Friday text, you will also automatically receive our “Get Your Date On” text each Monday that gives you a date idea for that upcoming Friday. Men can choose to sign up for the HIS version of the Marriage Challenge on their own or with a spouse. The HIS version is designed to complement the HER version, so couples using both can enjoy week after week of romantic ideas. Coming up with date ideas can be difficult, and that’s why The Dating Divas sends suggestions to couples. Husbands also receive the bonus Get Your Date On text on Mondays during the three-month period. This date idea will be the same one sent to the HER version — so couples won’t be planning different dates on the same day. The Dating Divas promise this challenge will have couples falling for one another all over again in no time. Lastly, the Dating Divas has a combined HIS & HERS version of the challenge available for the bundled price of $50 for three months. The text service is the same as the other two services — romantic ideas sent twice weekly to each partner plus a Friday date night idea — but for a discounted price. Couples can pack a lot of love into their weeks by taking the marriage challenge together. Some people think loving someone means never getting tired of being together, never feeling bored or restless, and never losing sight of what you like about them. But that’s just not true. Couples need to reinforce and strengthen their love over time, or it will fade away. A good marriage takes work — but that work can often be a lot of fun if you do it right. The Dating Divas encourage couples to reconnect with one another by showing love in creative ways and planning unique date nights. 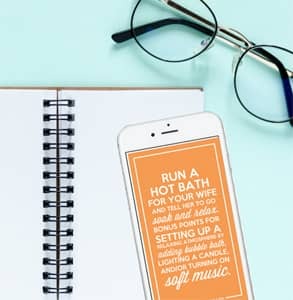 The website is full of gift ideas, relationship resources, and marriage advice, and now the team of fun-loving married women has decided to share their wealth of knowledge in a three-month text service. The 10-Minute Marriage Challenge offers couples a way to create more excitement in their everyday lives by being spontaneous and affectionate with one another. Marriage requires a daily commitment, and the Dating Divas provide regular inspiration to remind the men, women, and couples who sign up to cherish each other and show how much they care.